In the coin centre a bust of Queen Margrethe II of Denmark in a hat facing left. 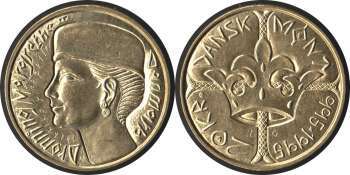 The commemorative coin with face value 20 kroner from 1995 marks the 1000th anniversary of the Danish coinage. The deep relief makes it unusual. 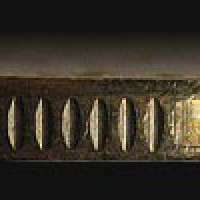 For the first time in the history of modern Danish coinage a very deep stamp was used to imitate the medieval coins. The reverse is not a copy of any specific coin. 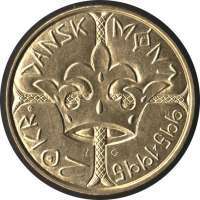 A crown and a cross are popular medieval motifs on Danish coins. Below there is an example of a coin struck by Sven Forkbeard in ca. 995. The inscription says: ZVEN REX DAENER (Sven King of Denmark). 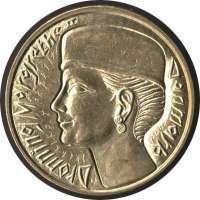 Coins of this type are considered to be the beginning of the Danish coinage.